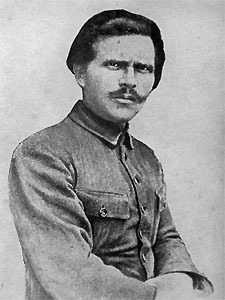 This site is dedicated to the Ukrainian anarchist, Nestor Ivanovich Makhno who was active in Ukraine during the Russian Revolution and in Paris from the mid-20's to the mid-30's. The content includes practically all the material regarding Makhno, the Makhnovist Movement and the Organizational Platform which is available on the Web. If you know of any suitable links or have texts or material that can be included, please let me know. The Daily Bleed's Anarchist Encyclopaedia, including a page dedicated to Makhno. If you are interested in anarchism and history, why not join the Anarchy_History discussion list?